The Golden Joystick Awards, where we honor the biggest games of the last year, are fast approaching. You've less than three weeks to have your say on the greatest games of the last 12 months. We've made sure that you can back your hot picks in the easiest way possible with a friendly Facebook bot. No, it isn't a sentient cyborg ready to take over the world, it's just a super easy way to make sure your favorite games are getting the recognition they deserve. Start chatting below to register your votes for categories from 'Best Storytelling' to 'Ultimate Game of the Year' and claim a free eBook worth up to $20.99 / £15.99. Your new electric buddy will allow you to vote quickly via Facebook Messenger and dispenses video-game trivia. Hey – even our robot overlords have to start somewhere. Voting will also score you a free ebook. Your choices include Edge Magazine's 'The 100 Greatest Videogames', 'The PlayStation Book, 2nd Edition', PC Gamer's 'The Best PC Games Ever', 'Nintendo Switch', 'The Ultimate Guide to Minecraft vol. 20', and 'The Retro Gamer Book of Arcade Classics, 2nd Edition'. You'll receive instructions for claiming your gift via e-mail after you've submitted your votes. 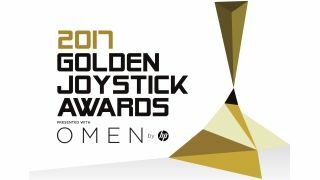 The 35th Golden Joystick Awards presented with Omen by HP will take place on November 17th, hosted by comedian and Assassin's Creed star Danny Wallace. We've partnered up with Twitch to bring you the whole the ceremony via livestream as well as interviews, trailers and more.